Feline immunodeficiency virus (FIV) classically infects felid species with highly divergent species-specific FIVs. 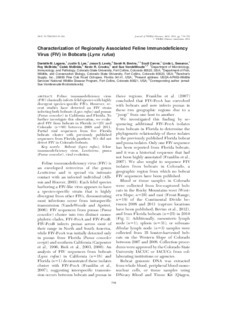 However, re- cent studies have detected an FIV strain infecting both bobcats (Lynx rufus) and pumas (Puma concolor) in California and Florida. To further investigate this observation, we evaluated FIV from bobcats in Florida (n = 25) and Colorado (n = 80) between 2008 and 2011. Partial viral sequences from five Florida bobcats cluster with previously published sequences from Florida panthers. We did not detect FIV in Colorado bobcats.